Audio and controversy seem joined at the hip. Tubes versus transistors. Exotic cables vs. lamp cord. Potions and lotions vs. just play the sucker attitude. And of course, dynamic drivers vs. planars. Despite this clannish behavior -- or better yet, because of all these controversies -- the audio hobby remains great fun. Especially when you're open to any kind of belief, zealotry, religion or spin. If music is the highest goal achievable, the means become secondary. Planar drivers are very different from dynamic cones and domes. 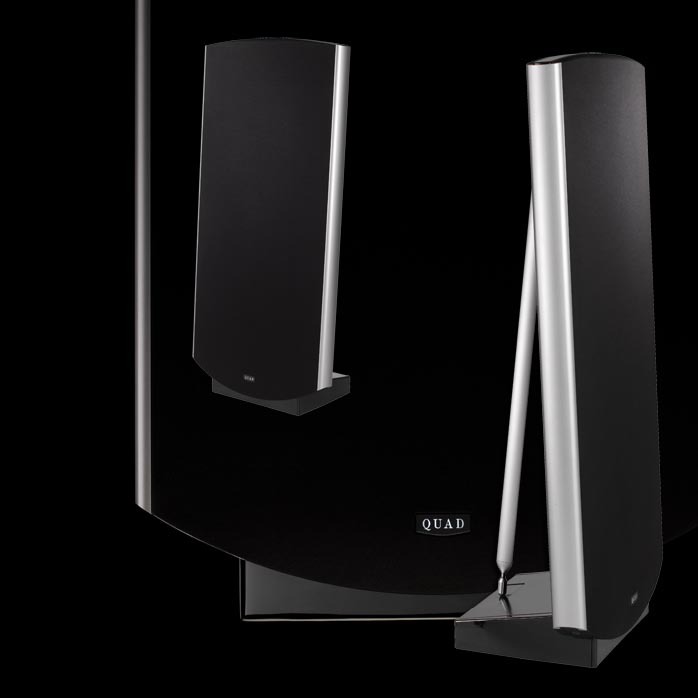 Instead of a relatively small cone pushing to excite the air in a room, planars use a relatively large while ultra-thin stretched membrane to do the same. Music is literally in the air with little effort. Within the planar camp, magnetostatic and electrostatic forces may be harnessed. The former could be said to have more similarities with dynamic drivers in that both use electromagnetics for their motors. An electrostatic driver is in fact a large capacitor. A very thin membrane tightly stretched sits between two stators. This membrane is made out of a plastic -- often Mylar -- and will be charged with a very high voltage. When the incoming audio signal hits the stators, an electrostatic field results. This field is subject to the signal voltage and varies accordingly. The stretched, highly charged membrane has its own electrostatic field which reacts to the varying field on the stators. As a result, the membrane is pushed and pulled forward and backward and acts like a large flattish piston. To get the membrane working with sufficient push to transduce the incoming signal into a large-enough motion equivalent, a lot of voltage is needed. The charge put on the membrane runs in the thousands of volts. 10KV is no exception. The stators too need much more than the handful of volts from the incoming audio signal. These requirements lead to the need for onboard electronics and an external AC source to step up the voltage. 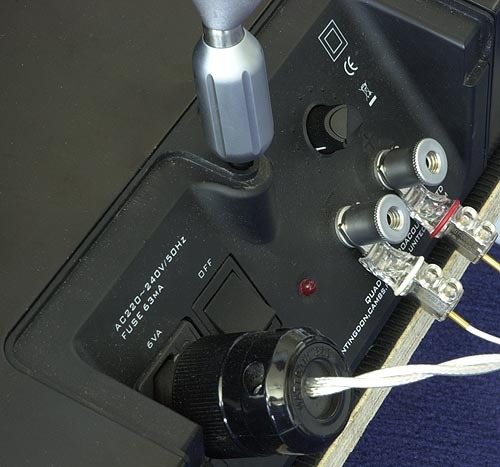 In the base of many an electrostatic loudspeakers, one thus finds the requisite transformers that do the work and are assisted by an incoming AC power line. The stators of course cannot be made of solid plates. They must be acoustically transparent enough to let the air through which is excited by the polarized membrane. Hence the stators are perforated or form some kind of honeycomb pattern. Next to being open enough to let air pass through unhindered, the stators must be isolated enough to prevent sparks to arc across the stators and burn the membrane. One way of isolation is distance. When a large voltage comes in on one of the stators -- when we are playing loud -- the excursion of the membrane can exceed the safe distance between stator and membrane and burn a hole. That's why stats have limited maximum SPLs and a safety circuit that prevents undue excursions. wide frequency range and so should the electrostatic loudspeaker. Various makes use various solutions to spread the frequencies across the membrane. Some use more than one panel, others add dynamic woofers or employ an inventive way to assign different frequencies to different panel areas. 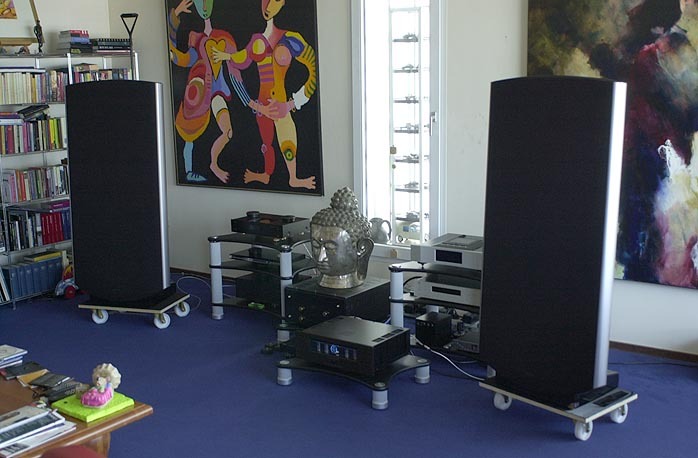 Membrane loudspeakers are by design dipolar, meaning they emit just as much sound out front as through the back. The only difference is phase. As this phase difference is 180 degrees, a listener standing at 90 degrees at the side of the loudspeaker experiences the cancellation effect of these two opposing signals. This means that dipolar speakers are very sensitive with regard to the wall behind them but don't much care about the walls beside 'em. 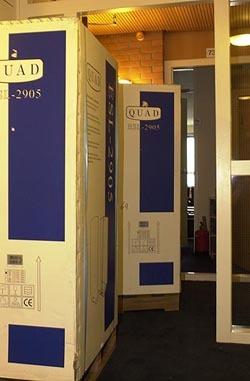 We received a pair of the latest Quad ESL loudspeakers, their largest full-range Model 2905. Since the year of its inception 1955, the ESL has been subject to many upgrades and changes from the original Model 57 through the legendary Model 63, the 989 and now the 2805 and 2905. In whatever guise, Peter James Walker's original concept remains ever present. Walker wanted to create the most natural sounding loudspeaker and the use of an extreme thin and hence very fast membrane or diaphragm would facilitate this goal. Yet he had to cope with many challenges - arcing, extra panels for broader frequency coverage, the electronics to spread the signal in time over these panels and the extra distance between the membrane and the stators in the middle of the loudspeaker. The latter is due to fact that the membrane is fixed at the sides, thus the free area has more breathing room yet must not come too close to the stators. He also had the brilliant idea to construct a number of concentric circles in the middle of the membrane and use a time-delay circuit to spread the incoming signal over these circles like ripples on water. Quad the company too has been through perils. Today, a Chinese company owns it and we are fortunate that they invested substantially in build and design quality. 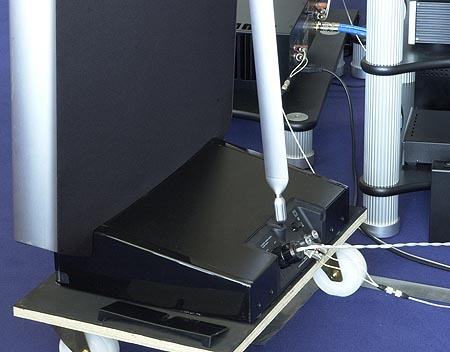 The ESL 2905 is far from a small loudspeaker. With its 143 cm height, 69.5 cm width and overall depth of 38.5cm, you won't miss it. It takes some inventiveness to get the speakers out of the shipping carton if you don't meant to tear the latter apart. That box has a total height of nearly 2 meters including the pallet it comes on. In order to slip the carton off, you need additional height of course. We managed to uncover the ESLs by putting the boxes on their sides and sliding the covers off. Once unboxed, the 41.6 kilos are fairly easy to handle. The speaker sits on a relative small black base. From the base rises a stainless metal frame, forming a rigid structure for the stator-membrane-stator sandwich. A woven black cloth covers all. At the back, reaching from the speaker's top to the end of the base sits a triangular strut, adding stiffness to the design. All prior criticisms and concomitant aftermarket solutions about lack of rigidity from the Model 57 through 989 are now a thing of the past. The 2905s are as steady as one could wish. The base holds a pair of WBT loudspeaker terminals, a dimmer for the illuminated 'Quad' decal on the front, a mains connection, a power switch and an indicator light. Under cover hide three transformers and the time-delay circuit for the six panels that make up each 2905.There is no classic crossover circuit on board. Overall, the construction looks very well attended to. Our review pair had been through some rough weather at shows and was a little scratched and chipped, nothing serious. You do wonder though how people treat stuff that isn't their own. Cosmetically, incorporating two large black surfaces into a room can be challenging. On the other hand, black makes one look slimmer, no? is another matter. Being dipoles, the rear energy should not disturb the imaging, thus the combination of toe-in and front wall distance becomes crucial. Sidewall distance is no problem. Then there is rake. The 2905 is tilted backwards but with the standard cone feet, the angle of tilt can be adjusted. We elevated the whole speaker on casters to move it around easier and thus had to compensate by raising the back of the base a little. For power cords, best to use are ones that are neither too heavy nor stiff. The power inlet sits at a 45-degree angle and is a bit loosely coupled to the base. Loudspeaker cables can be terminated in any way. The WBTs accept all comers. Quad rates the ESL 2905 at about 86dB sensitivity and a nominal impedance of 8 ohms (the impedance fluctuates between 4 and 20). This makes the ESL 2905 a good companion for the Moscode 401 HR, the more so as Harvey 'Gizmo' Rosenberg to whom the 401 is dedicated --hence the HR -- chaired the Quad ESL Owner's Club way back when. When all tubes in the system had reached operational temperature, it came time to get some signal to the transformers in each 2905's base. These transformers have their primary windings switched in parallel and their secondary windings in series. This allows smaller iron, a higher cutoff frequency and thus wider frequency response. First signal to the electrostatic panels was by way of Cuatro con Cuatro where oud, guitar and cello provide a nice spectrum to voice the loudspeakers through positioning. From the first note, the fantastic clarity of the 2905 proved seductive. Instead of jumping up to correct the placement of the black doors, we listened. We went through the complete CD almost forgetting to breathe. 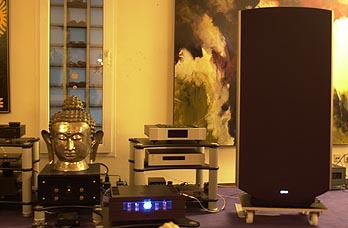 Karim Baggili's recording was extraordinary already on the 107dB Duo Omega, now it gained further airiness. Where the horn-loaded Avantgardes are lightning-fast, the ultra thin membranes with their concentric circles driven by time delay circuits are faster yet. Mid and treble tones possess an eerie precision. Bass, real bass coming from the full-range electrostatic speakers is just as fast as the higher frequencies and goes deep well enough. Con arco cello on open strings? The full depth and impact are there, just behind the guitar. Where the Avantgardes are a looking glass on the music, the Quads are microscopes. Have you ever seen the film Microcosmos? The Quads, even in their preliminary position without any tuning or fretting give you that sense of immersion in a world usually unnoticed. Miles Davis' The Cellar Door Sessions are great recordings and can give the illusion of being in that Cellar Door studio. This proved ideal to start moving the 2905s around to wring the last drop of juice from these flat, black gates to the music. In our room, we obtained the best results when the front of the speaker was 1 meter from the wall behind it. This wall is covered with large oil paintings and not a hard reflective surface. A very slight toe-in of about 3 degrees offered just the right balance between too much ambient sound and focused soloists. Just another little adjustment to the rake in the vertical plane and presto, we were happy. Music maestro! Music with the Quads seems to originate from a point behind the transducers. When the term point source was coined, it must have been while listening to a Quad ESL. This point source is not just radiating middle and high tones. Bass too comes from that one hole in time and space. This is not a given for all electrostatic loudspeakers. Only Quad as far as we know employs concentric rings in the membrane to produce a literal ripple effect for the wave launch. In the lowest frequency range, something quite remarkable happens. With dynamic drivers, bass response needs space and thus time to build up. 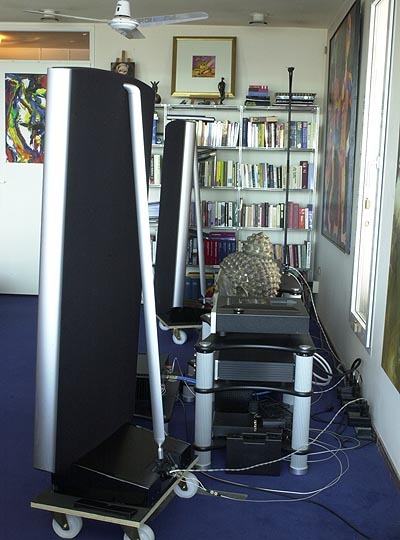 Listened to from very close up, a dynamic loudspeaker system often lacks bass. The large membrane of the ESL however can very easy build up enough air pressure to make liquid bass possible from such a position. Bass tones are created with unbelievable ease, without any boom or exaggeration whatsoever. Integration of bass, middle and treble is unique and completely time-coherent. The usable extension to roughly 40Hz is more than enough for most music. The most incredible virtue of the 2905 is cohesion. Bass and treble are almost one. The liquidity of both ranges is equal. The bass is - well, just lower. The treble at first seems a little modest and shy. It lacks the in-your-face character many tweeters exhibit. On voices however, it has a great sense of naturalness. These 2905s with their mild highs make long listening sessions possible without any fatigue setting in. And with the 2905s, you have to listen long, that's how addictive it is. the instrument. At the end, the decay is just like its origin - the tone dies off and back to the point whence it came. With its wonderfully natural smoothness, its amazing focusing capabilities, its rare time coherence and absentee fatigue factor, the 2905 seems like the ideal loudspeaker. It is, in fact - with a few restrictions. The ESL 2905 does not like loud music. If you don't either, you're in business. At about 98dB/1 meter, the 2905 thinks it's time to close shop and shut down. As sound pressure builds up towards this 98dB threshold, there's a terrible sonic fallout at first. It's like a damaged CD where samples fail. If you ignore these early warnings and fail to immediately turn down the volume, the Quad protection system will taker over and shut you down. Too bad, you've played too loud. However, a German magazine documented that using 5 ESLs in a surround setting can produce enough SPLs to blow your mind or eardrums. When you have a moderately large room of around 40 to 50 sqm (360 to 450 sqf) and think that 90dB is great for listening for hours on end to well recorded music in your favorite listening chair, then your'e a Quaddie. Once you've heard a 2905, there's no further room for controversies. Where Kubrick had his black monolith as the Philosopher's Stone, we have the 2905 as the Musician's Stone. Magic time!